Sometimes I feel sorry for push systems. You know, they get a bad rap. But there was once a time when batching and push sytems were all the rage. We all know how lame the Everly Brothers are. Right? You mean, you haven't heard of the Everly Brothers? Me neither, but they're from a different time. My mom listened to them! Apparently they were cool for awhile, and they made a lot of money. But now they're a little passé. A little old. Just like push systems. They worked well for awhile and now there's just no place for them anymore. But Led Zeppelin? That stuff endures, man. I can listen to Jimmy Page for hours. He just rocks. And according to this old blog post by Richard Durnall, pull systems are like Led Zeppelin. They were invented awhile ago, but they still rock hard! As you can see from the illustration above, pull systems truly do rock. And so does that blog post. 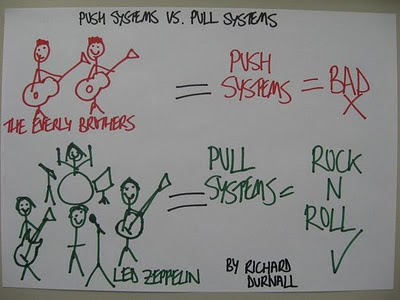 Using simple markers and paper, Richard illustrates the difference between push and pull systems. I chose to link to this old blog post because it demonstrates excellent presentation skills. 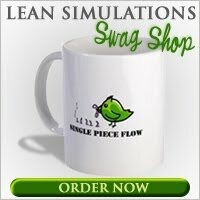 You don't need a computer and fancy Powerpoint slides to teach Lean. You just need some large pieces of paper and a plan. And if you can throw in a little humour, that generally helps. "Create pull-based systems where possible." The picture is very cute and easy to understand.